The natural spatial dynamics of mangals are part of a larger environment — tidal marshes — which generally also includes highly saline or acidified ‘tannes’ (areas without any vegetation or covered with grasses developing at the expense of the mangal) developing at the expense of the mangrove. This dynamic is clearly visible in the pattern of vegetation at the edges of mangals. Their appearance varies considerably depending on where they are situated: facing the sea (seaward front of the mangal) and on the banks of channels or the margins of ‘tannes’ and swampy formations (landward front of the mangal). In each case, different forms, revealed by studying the architectural layout of the mangroves, can be compared. These forms, which follow a defined typology, are linked either to the progradation or to the total or partial retreat of the mangal. The identification of these forms by enabling an efficient diagnosis of the mangals dynamics has many possible applications. Notably when it is necessary to restore parts of the mangrove or to develop parts of the coast. This method even if it cannot provide irrefutable conclusions in every case, has the advantage of providing a simpler and more rapid diagnosis than diachronic analysis or aerial photography. 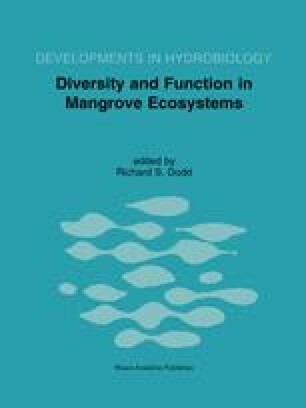 More than any other kind of vegetation, mangroves present in many cases remarkable natural dynamics. Particularly because they are subjected to the continual variations in sea level, and to variations in climate and of sedimentation, which are more restrictive than in other ecosystems, they appear condemned to never-ending transformations. In a majority of cases, these changes are perceptible over the period of a decade, or even sometimes annually. This is rare in other ecosystems if one excepts consequences of direct human intervention. Tangible signs of these forces within the coastal areas where mangals grow are apparent in the different types of forest margins which we observed in Gabon, Madagascar (Lebigre, 1990), Brazil (Lebigre & Rebelo Mochel, 1995) and Mayotte (Lebigre, 1997), and which have also been encountered and described by other researchers (notably Baltzer, 1975; Lescure, 1977, 1980; Marius, 1979; Bertrand, 1993). A correct analysis of the mangal margins that have been preserved from direct human intervention make it possible to comprehend the natural phenomena which govern them (sedimentation, sea-level variation) and, thus, costly errors in developing the coastal areas can be avoided.